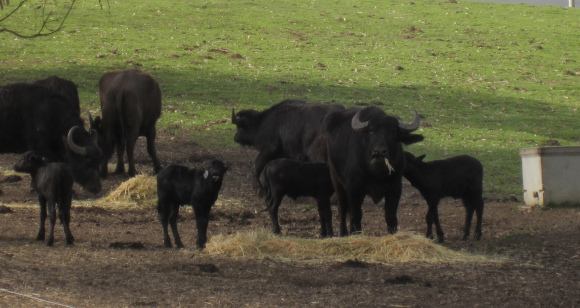 We got to see baby Water Buffalo! That may not be enough reason for you to get up in the early morning fog and hop on a van that promises to take you to three farmstead creameries, but that was enough incentive for me. Luckily Wally, my partner in adventure and my husband of 35 years, will jump on any bus that holds the promise of fresh Water Buffalo Mozzarella. The tour was part of the California Artisan Cheese Festival that is held in Petaluma each spring. We chose this one because each creamery had animals on property (so we got to see baby animals), each had different animals, and all were family run. First up: new kid on the farm Ramini Mozzarella. 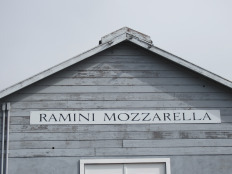 One of only two small Water Buffalo farms in Northern California, Ramini is determined to duplicate his Italian ancestors steps in making top quality Mozzarella de Bufala. Listening to him enthuse as he speaks of his herd – 36 buffalo with only 10 milking currently- and the process of milking and making the cheese all in one day you know this is truly a passion. Why else would you spend all day milking your buffalo, hand making the cheese, and taking exceptional care of all your animals? It is one loooong day. 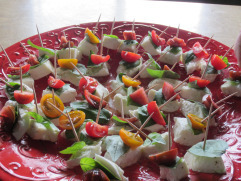 But his pride is evident, as is the taste, as we sample a plate of his cheese with tomatoes and basil. It doesn’t get any fresher than this. Some facts about Water Buffalo Farming and the Cheese: The milk is about 10% fat, three times the fat of cow milk. His babies stay with the mom for about a week, then go down to nursing once a day, but they will naturally start eating grass after about 3 days and will be on full grass after a month. He keeps them with the moms during the day, they both do better as a result. Second: Valley Ford Cheese Company, they’ve been a dairy farm for over 90 years. 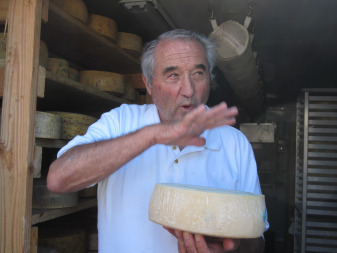 The Cheese Company was started in 2008 but the roots to this dairy go back to 1918 when Pietro and Maria Bianchi bought 640 acres for dairy farming. It has stayed in the family all these years and its primary business is still to sell milk, with Clover Stornetta being one of their clients. Pietro’s granddaughter, Karen Bianchi Moreda, who had been working with the dairy most of her life decided she wanted to try her hand at artisan cheese making as well. Leaning on her family’s Northern Italian heritage, but using the terroir of Northern California, she fashioned Highway One, a semi hard Fontina style cheese with grassy notes, and Estero Gold, a harder cheese with a nuttiness like Asiago, that develops and crystalizes as it ages. She sells the Estero Gold at 6 months and 18 months. She now has a 12 month Estero Gold that we love, but sadly it isn’t on the open market just yet. But we are standing by. Third: Two Rock Valley Goat Cheese, an irrepressible couple who, in addition to running a cow dairy, decided to make goat cheese so Bonnie, the wife, could keep all of her goats. All 160 of them! Bonnie and Don have been married for 49 years, their enthusiasm for their goats and their cheese provided laughter and inspiration. Ah, I’ve heard this story before. 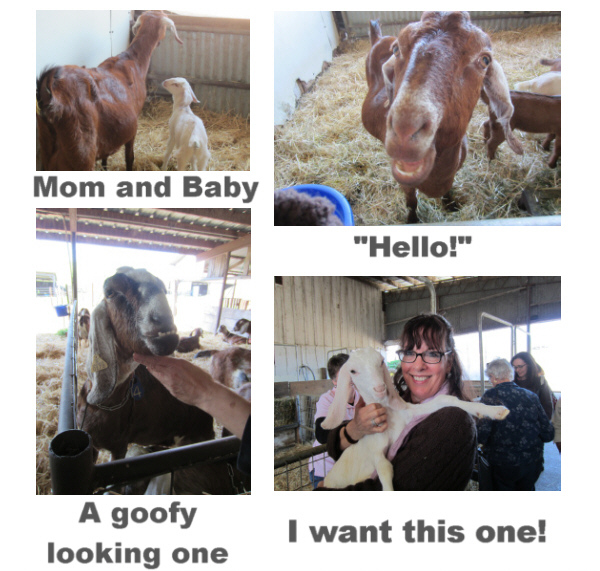 It could almost be the beginning of a joke: A woman buys a few goats…kind of like, “a man walks into a bar…” or “there was a priest, a rabbi and a minister.” This time the woman is Bonnie DeBernardi and she buys 2 cute Nubian goats (those with the bunny like floppy ears) for her grandkids to play with. That was back in the 1990s. 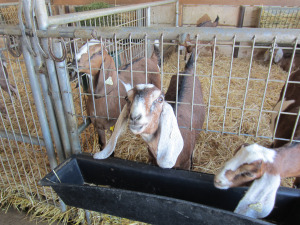 Now she has 160 goats which she tends personally while her husband Don makes goat cheese three times a week. This is in addition to running a dairy farm. Those goats, so cute, so alluring. And thank goodness! The cheese Don is making is delicious. Like many farmers we’ve met in Northern California Don is of Swiss and Italian Heritage. 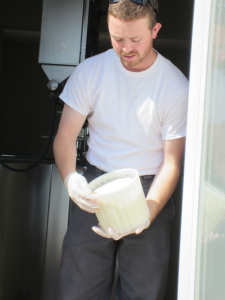 He decided he wanted to do what his Granddad did, so off he went to study cheese making with relatives in Switzerland. He also had an expert come in and help him after his first few batches had gone wrong. He has the smallest cheese making room I’ve ever seen and a small shed that acts as his aging room. At the age of 70 he still finds joy in each batch and expresses wonder at each one, somewhat amazed by it all. After tasting his goat brie and his 6 month semi hard goat cheese I was amazed too. I hope to have his cheese at Fancifull soon. Right now he is only selling in Northern California, but if I have my way, I’ll get a wheel or two down here as well. I relish the opportunity to visit these farms firsthand. One gets to smell the air, meet the animals and get a true view of what it takes to bring a cheese to market. This isn’t something you do because you have nothing better to do. The word passion comes to mind often as I talk with these artisans. I look it up and see it comes from Latin, Pati which means “suffer.” Now that is interesting. I don’t think any of these people would say they suffer, but they do work long hours, are slaves to their animals, and will throw out a whole batch of cheese they have worked on for months if it isn’t right. They wouldn’t have it any other way.